Every day from now until 2030, a Baby boomer will turn 65, a move that takes them closer to retirement. Who will take their place as leaders? Who will replace their vast reservoir of knowledge and experience? Organizations around the world are grappling with this dilemma, and collectively face the urgent need to quickly bring the next generation of leaders up to speed. 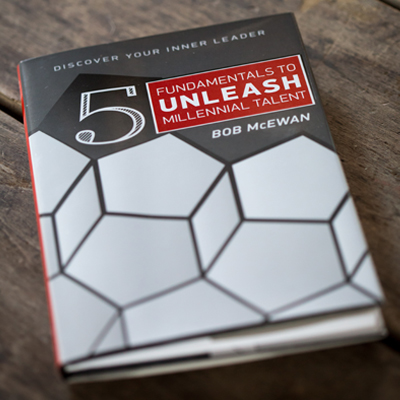 Five Fundamentals to Unleash Millennial Talent is designed to help bridge the gap by teaching the millennial workforce about the skills they need to learn to become effective leaders. It is structured around the “Five F’s of Leadership” – Firm, Fair, Friendly, Family and Faith. Being a firm leader is all about setting a vision, communicating the vision to inspire the team and executing on goals. Leaders must have confidence, discipline, strong analytical skills and the ability to be tough minded. Strong leaders act with integrity toward their employees and customers, and always lead by example. They establish respect and trust, which is earned by being transparent, listening, seeking input and doing what they say they are going to do. Leaders need to be positive, reward people for a job well done and build relationships. All while having some fun along the way. Everyone wins in a fun and positive environment that fosters growth and development. Great teams are like great families, comprising people who are connected by common relationships, goals and visions. The leader needs to help create this family, ensuring mutual respect and trust even given the inevitable disagreements. Leaders cannot master the other four f’s without having faith in themselves and their abilities. And they need to recognize when it’s time for a recharge.